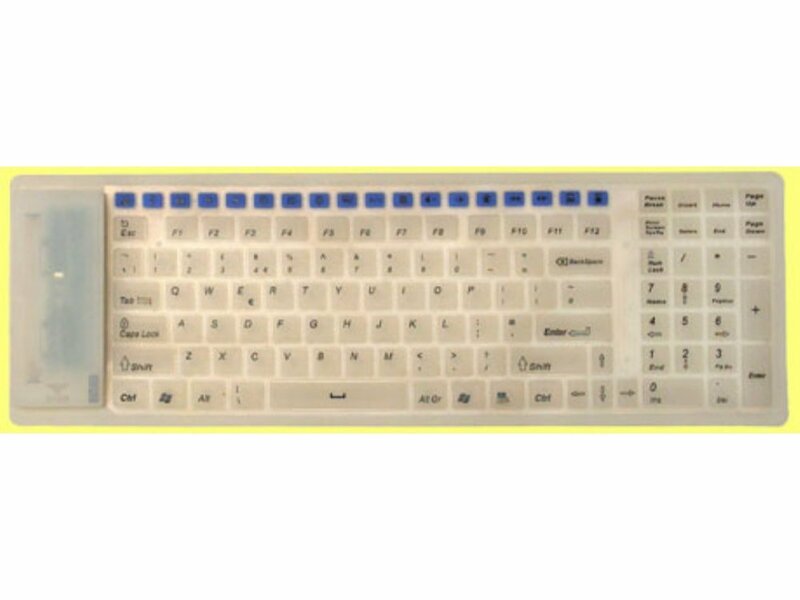 This flexible keyboard is made of a high quality silicone material, which offers the perfect combination of practicality, durability, and flexibility. The unique material allows you not only to clean the keyboard with soap and water, but make it resistant to dirt, and coffee or tea. Simply wipe up any spilled liquid witha damp cloth, and then continue working. This keyboard is so flexible, that you can roll it up and bring it everywhere. This lightweight, ultra-slim and compact keyboard is perfect for travel, school or any other work environment. It fits easliy in your briefcase, backpack, or notebook carrying bag and you don't have to worry about any sharp edges. The soft material allows a quick tactile feedback typing action that is silent. Contents:- Radio wireless keyboard, USB receiver, user guide, installation CD and two AAA batteries.